« What do Linnaeus and Monet have in common with Tulsa? I am going to start out with the best one ever: Tomato Jam. 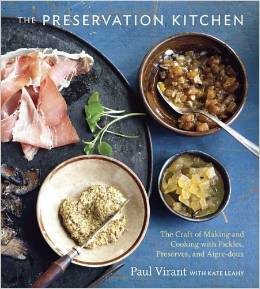 If you have a garden, visit farmers markets, or belong to a CSA, you must have this book: The Preservation Kitchen by Paul Virant. I have crushed and canned, diced and canned, and roasted and canned (and salsaed and canned). I was ready for something completely different. Tomato Jam fit the bill. 1 onion, thinly sliced (a scant cup) I used a few small red and white onions. Peel tomatoes by scalding them and then placing them in a water bath. Heat the olive oil in a large pot over medium heat. Add the onions and season with salt and pepper. Cook until the onions are limp. Add garlic and continue to cook until the onions begin to brown (but don’t burn the garlic). Stir in the sugar and stir until the sugar has dissolved. Add the wine and cook over medium heat, simmering rapidly, for about 15 minutes. Add the tomatoes and let simmer for 45 minutes. The jam should be thick and coat the back of a spoon. Sterilize 3 pint jars and lids. Ladle the jam into the jars leaving a 1/2-inch space. Wipe rims and seal with the lids. Screw on bands. Place in a canner, covering the jars with one inch of water. Process in a boiling water bath for 10 minutes. Turn off heat and remove canner lid. Leave in the water for a few minutes. Remove the jars and let cool completely. The only thing I did different was to add the garlic to this recipe. 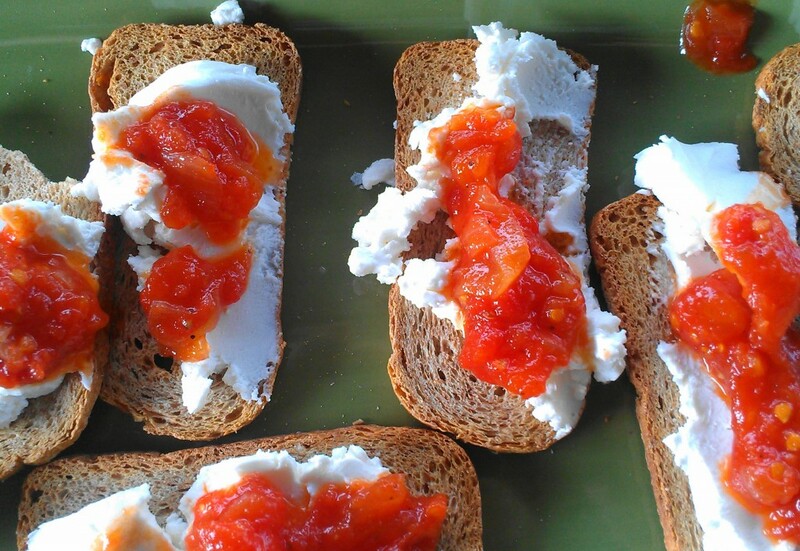 Our favorite way, so far, is to serve it on top of goat cheese on crostini (or in this case, Melba toasts). 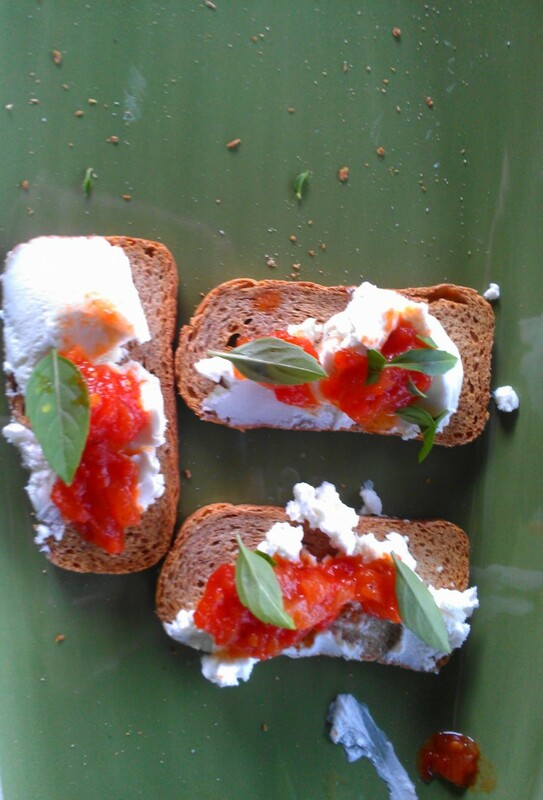 It was his idea (as we sat on the patio crunching away) to put some Pistou basil on top. What I love most about The Preservation Kitchen is that the preserved/canning recipes are referenced for use in other recipes. Buy the book and you can find how to use up the Tomato Jam in “Tomato Glazed BBQ Goat” and “Tomato-Jam Roasted Potatoes.” I don’t see the goat in our future, but I am sure I will make some of these potatoes….only if I can wrench some of the jars away from The Hubs’ grasp. I wouldn’t be surprised if he has hidden it all away by now. Very smart man indeed. There are just some things you wanna keep for just you! I just got a lot of tomatoes at the outdoor market yesterday and want to try this recipe. I know my Hubs would love it too. Now I see that I need to get even more tomatoes at the outdoor market! Hey, Joyce. Yes, you will need to get your hands on more tomatoes! I did grow some black tomatoes, but not enough to make jam. Must visit farmer market next week! Maybe you can make a half batch. 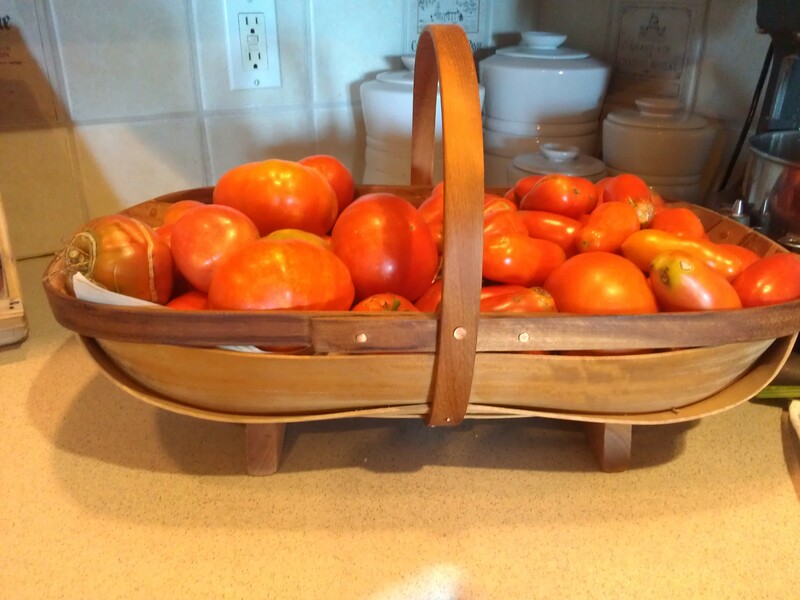 I just visited a wonderful farmer’s market in the NC mountains and couldn’t resist buying a slew of tomatoes. This sounds amazing! WOW! Look at those tomatoes! What fun! If this jam recipe is what you’re starting with, I can’t wait to see what’s next. I see lots of ways to use this jam. I know that in the dead of winter we will be using this up like crazy. I made a batch of tomato jam a few years back once and it was fantastic. Your version looks wonderful too! Tomato jam – I want it. I never thought about making tomato jam but you have me eager to try canning. I have enjoyed reading about all the wonderful harvest you from your garden and I want to can too! Don’t blame you for keeping those jars of jam. That book looks like one to add to my wish list. At work last year a co-worker from Nebraska asked me to make some tomato jam with all my tomatoes – so I did but I never tasted it……the recipe she gave me was a family recipe and she said she absolutley loved it. It didn’t sound good to me – but this recipe does! YUM! I should try this for sure! I cannot stress out delicious this stuff is. Am making some more this weekend!